Do Hindu scriptures provide details on how to properly name a child? If there are any do’s and don’ts. Is it really necessary to name child based on month or tithis? Naming of the child is an important ceremony in Hinduism. As per scriptures, it is required to be performed when the child attains a particular age (in days). Manu Smriti 2.30. But let (the father perform or) cause to be performed the Namadheya (the rite of naming the child), on the tenth or twelfth (day after birth), or on a lucky lunar day, in a lucky muhurta, under an auspicious constellation. The names should be chosen according to the Varna of the child. 2.32. (The second part of) a Brahmana’s (name) shall be (a word) implying happiness, of a Kshatriya’s (a word) implying protection, of a Vaisya’s (a term) expressive of thriving, and of a Sudra’s (an expression) denoting service. These are all the rules given in the Smritis. According to astrology, depending on the birth Nakshtra, the names should be chosen. For example, for someone born in Ashwini Nakshtra the name should start with the letters like Chu, Cho, La etc to be considered as auspicious... and so on. 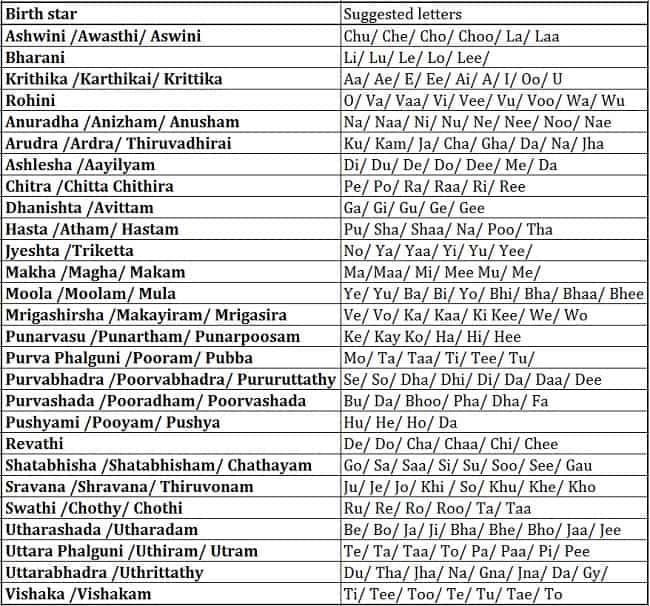 For Bharani Nakshtra born the names should be starting with Li, Lu etc.. I do not have scriptural references for the above list for the time being. Not the answer you're looking for? Browse other questions tagged scripture customs .